I just thought I'd point something out which definitively invalidates one map or another. The DF map clearly lines up well with the top center section of the AQW map, as has been stated, but shape is as far as it goes. The one location that is ascribed to both maps, Oaklore, is in two completely different locations. The two maps are therefore inconsistent with one another despite the shared shape and one must be disregarded in terms of locating places. The clear choice to me seems to be the AQW map, given its other problems. Edit: I made THIS with the old AQW map. The text may be hard to see, but zoom in! This is a bigger version of the old AQW map. Tell me if this is useful OR if it's useless. Well... the old AQW map was quite clear in stating that it was inaccurate... Good effort, but I'm afraid its use is limited. What would be really awesome is if we could fill in the missing part of the globe for the map like ZAX once was doing, but I don't have the artistic talent (or even the technical photoshop knowledge to hack anything together), and those that do tend not to have the time to work on it. It's disappointing that it stagnates like this, but hopefully there's enough information gathered (and possibly continued to be gathered) for whenever someone can step up to the plate. Comparing this and this it looks to me as though the main land matches up reasonably well. 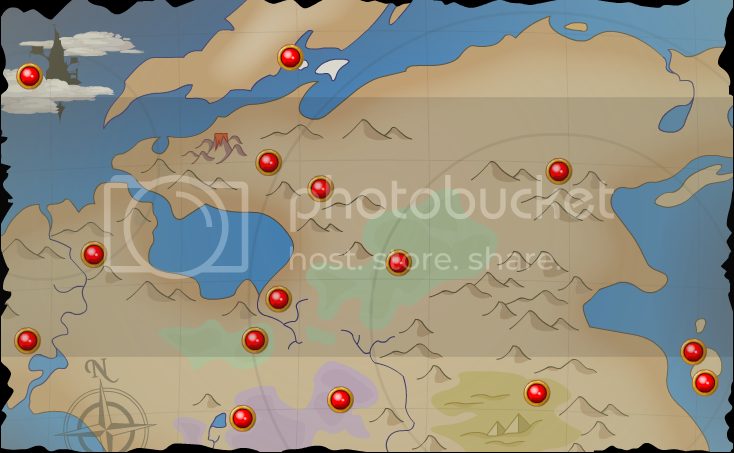 The AQ map shows the bottom of AQW Oaklore and around AQW Lolosia, though they aren't located perfectly. If someone could do a bit of photoshoping and merge these three images (AQ, DF, AQW) so we could see the end result that would help I think. Note that I do know the AQW map has been proven inaccurate. Edit: In this version of the AQ map, there appears to be an extra land addition. When compared to the AQW map, the extra land could actually fit in perfectly. If anyone does do the photoshop combination, maybe make two versions; one with each AQ map. The "horns" are swapped in location between the two maps, and the one misnamed as part of the "middle isles" on the AQ maps is merged into the mainland in AQW instead of having a channel between them with a bridge over it. The WF views from space allow us to see much of the AQ Battleonia continent and they just do not match up with AQW's map. I'd just like to bring up again that I spoke with one of AQ's original cartographers and he said the Battleonia maps were never completed. The WF landmasses you see are unfortunately those unfinished maps slapped onto the planet for the space views. Battleonia in AQ is supposed to be shaped like a dragon's head, very similar to what we see in the other AE games. It is possible that one day the maps in AQ will be updated to better reflect this, but who knows? Perhaps these are lands for future games? I mean I expect AE to make more games in the future, so I suggest we ignore those land masses for now. thought the maps seems to fit, its not complety thanks to sandsea wich in df is placed at the east of necropolis n falconreach, when I joined the maps sandsea was placed in the empty space between greenguard and swordhaven, however in the realy AQW, Sandsea is alot alot more in the south, is this enough to blow the entire idea? well about the others places, since they arent anything yet in them in the aqw map, I atleast cannot question much about them. mielonciel, I made a topic similar to that. It is not just the Sandsea, but the placement of Oaklore and several other things as well that leads to inconsistencies. yeah i thought that too, well the only thing Im sure of is, that no matter how inacurate the map, Falcon reach IS right infront of the skull where drakath is in aqw! If one really compares the AQW and AdventureQuest maps the similarities become evident. 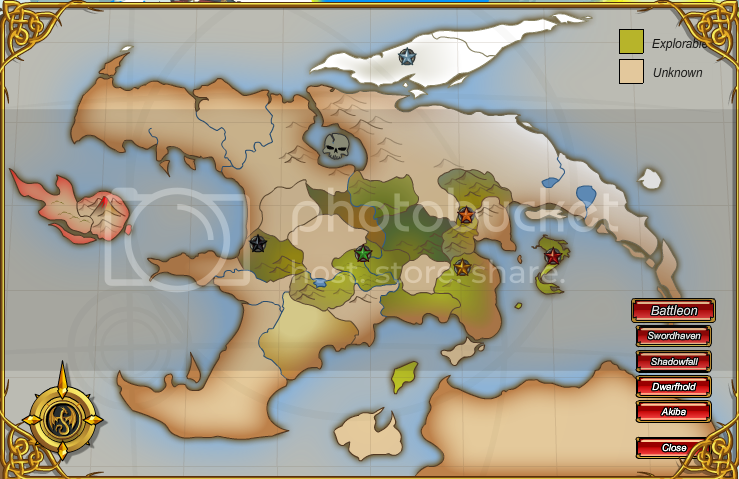 In the AQW map, the horn pointing out of the right side of the dragon's head is the middle isles while Paxia may be the island to the north. The lands over the sea such as Deren and Vandar cannot be seen in AQW. In the Original AdventureQuest map you have in the far west, going north to south: Darkovia, Greenguard, Orc territory (Augerthorn) and wetlands (Bennuju). This matches up with AQW almost perfectly with Darkovia in the north, Greenguard pushed further west, Bloodtusk Ravine acting as orc territory and the Neverglades being the wetlands. The Dwarhold mountains also match in both games while the area between Dwarfhold and Mythsong in AQW could be hypothesized as being the Dragonspine mountains. 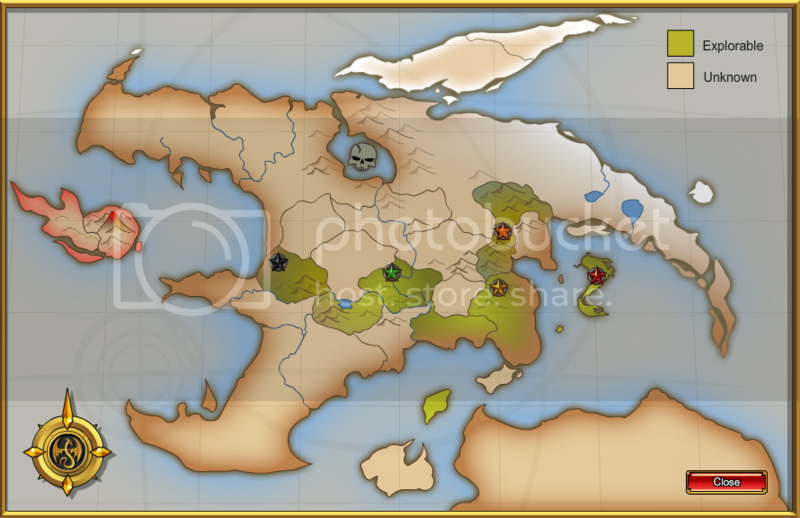 Sho Nuff Island from Dragonfable is present in all three maps but only labeled in that game. Draguesvard is also present in AQW but not labelled. In DF-AQW comparisons the Sandsea and Oaklore provide problems but I think both have been successfully retconed by AQW until further notice. The same could be said about Frostvale in AQ-AQW comparisons. 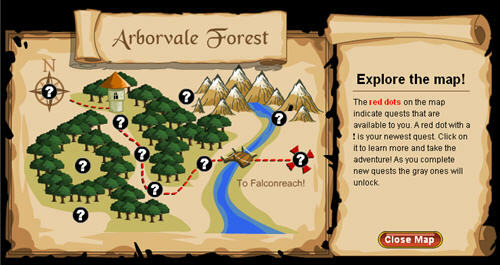 Judging from DF, the Doomwood is likely to be located in the area between Skullholme, Greenguard and Arcangrove in AQW. So far these two maps seem to provide the most useful images of Lore. Although here Vandar seems to be in the position occupied by Deren on the Travel Maps of AQ. This could just mean that we are bad at navigating as we travel across Lore, slipping South East as we travel, rather than going directly East from Paxia. and the others that I have seen from DF and WF just seem to show the differences between the games and can be explained by the multiple universe scenario which we have seen in many stories from all the games and particularly in the recent stories of AQ. Each world is roughly the same geographically as Lore of AQ because of simialr geological forces working upon each of them. But the specifics of the maps are different becuse of slightly different events in each planets history. So, someone with skills: Take the Advanced AQ map, put my AQ map (With some editing) on top of it, then combine it with AQW map and finally put DF map on top of it. With that, we will have the closest map we can muster. I'd agree that the locations on the DF map will help you map out AQ's own map much more effectively, and I have a true reason, other than preferring DF. AQW is set into the future if Lore. Thus, techtonic movements could have greatly changed locations, rendering the entirety of the AQW map useless at the present time. Not exactly: AQW is a combination of all 3 timelines (MQ, DF, AQ), and is not part of anykind of similar timeline. The reason still stands though: Changes are everywhere, and thusly Df is closer to AQ than AQW would be. Ah, but the merging of time-lines would have little affect on geography, unless it has taken on the Battleonia of MQ. So, either way, it's techtonic movements/magic. I won't be doing the merge of maps cause it would be ugly and totally useless looking. Sir Baumbard: Word has gotten back to the King in Swordhaven that slimes and undead are amassing on edges of the Oaklore forest. On 2... no idea what you're talking 'bout. That map is incomplete and only shows AQ's part of Lore, not all four(we are only using DF and AQ maps, so where do the others come from?) maps are used in that one. Tch, you both get me confused on which maps and randomnesses and maps and 4s are ya talking. Like said, for the current most accurate AQ map (for now) we'd need to take the AQW map, put DF map onto it and then the AQ map(s) on it.